Some people may feel that if you want a really good gaming PC under $600, you simply have to build it yourself. However, in today's hyper-competitive market, that isn't always true. In fact, you can get a fast, powerful, high-performing gaming PC for less than you may have imagined. Here are some of the best prebuilt gaming PCs you can get for less than $600. The CYBERPOWERPC Gamer Ultra GUA883 Desktop Gaming PC has all the speed and style you want in a gaming PC, with an affordable price tag as well. It's got a great look and some power under the hood to play all the latest games with the speed and quality you expect. The CYBERPOWERPC Gamer Ultra GUA883 Desktop Gaming PC has a great look, with a red lit interior and a sleek black case, with a tempered glass side panel for style and durability. It's powered by an AMD FX-6300 6 core processor with speeds up to 3.5 GHz. It has the AMD 760G chipset. It has an AMD Radeon R7 240 graphics card with 2GB cache memory. It has 8GB of DDR3 RAM and a 1TB hard drive. It comes with Windows 10 Home Edition pre-installed. It has VGA, DVI, and HDMI display ports, as well as 6 USB 2.0 ports, ethernet, and Wi-Fi. It is easy to upgrade over time. It comes with a 7 color USB gaming keyboard and 7 color mouse. It also has 1 a year warranty on parts and labor and comes with free lifetime tech support. 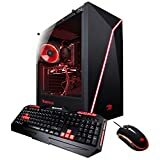 Over the past 20 years, iBUYPOWER has been gaining a reputation with gamers online and around the world and has also received praise from experts as well. They've been featured in HotHardware, Digital Trends, Tom's Guide, Gamer's Nexus, Linus Tech Tips, and won the 2016 Reviewer's Choice award. They take pride in delivering plug-and-play gaming PCs at an affordable price and backing them with a lifetime of support. 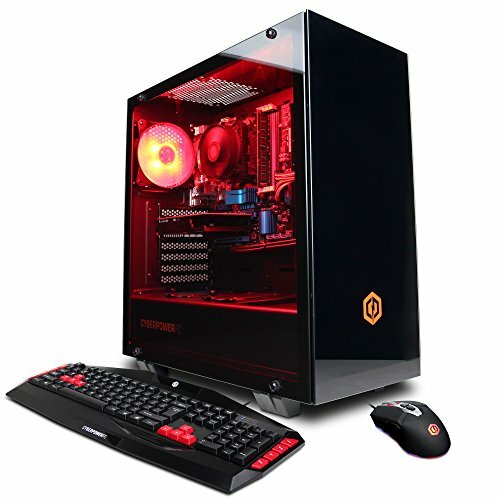 The iBUYPOWER Enthusiast Gaming Computer Desktop PC AM010A is maximized for the ultimate gaming experience. The AMD FX-6300 6 core processor has base speeds of up to 3.5GHz and can reach 4.1GHz Turbo. It has a Nvidia GeForce GT 710 graphics card with 1GB of memory. It comes with 8GB of DDR3 RAM, a 1TB hard drive, and Windows 10 64-bit Home Edition. It has 2 USB 3.0 ports, 2 USB 2.0 ports, and can support dual displays in DVI, HDMI, and VGA. It comes with ethernet and Wi-Fi capabilities. The red-lit and black case is sleek and stylish, and it comes with a gaming keyboard and mouse. It was assembled in the USA and has a 1 year warranty on parts and labor. 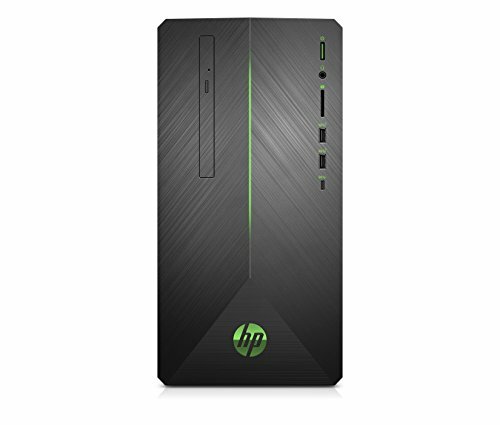 While HP Pavilion isn't exactly the brand that comes to mind when you think gaming computer, this tower is sleek, practical, and even powerful. It's got all the speed and performance you need, in a case that is a little smaller, more sophisticated, and more discrete than many gaming PCs. And, while HP isn't known for gaming computers, they are a reputable brand with a good track record of innovation, service, and support. The HP Pavilion Gaming Desktop Computer has a cool brushed-metal and green lit case, with a more compact footprint than many gaming PCs. But this understated case packs plenty of power. It's driven by an AMD Ryzen 3 2200G quad-core processor, with speeds up to 3.5GHz. The GPU is an AMD Radeon RX 550 with 4GB dedicated GDDR5. It has 8 GB of DDR4 RAM, upgradeable to 32 GB, and a 1TB SATA hard drive. It also has 5.1 channel surround sound to immerse yourself in your games. It comes with Windows 10 Home Edition. This computer is loaded with ports, placed front and back for all your peripherals. It has 2 USB 3.1 Gen 2 ports and 1 USB 3.1 Gen 1 Type C port in the front, along with a headphone jack and a DVD RW drive. In the back, it has 2 USB 2.0 ports, 4 USB 3.1 Gen 1 ports, HDMI and display ports, and a media card reader. It has ethernet 802.11 and Bluetooth 4.2. It is easily expandable and upgradeable, with expansion slots and multi-monitor capability. The speed of innovation and enhancements, coupled with the ever-more-demanding expectations of the latest AAA titles and the gamers who play them, mean that competition in the gaming PC market is tough. On the one hand, it means that the GPU that was brand new and top-of-the-line just a few months ago is older now. On the other hand, it keeps the cost of gaming PCs low as manufacturers race to keep up. This means that there are some excellent prebuilt gaming PCs that can be had for a bargain, and these are the best of them.